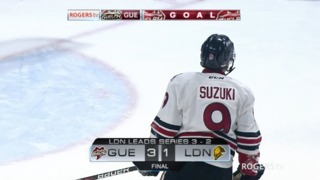 Five third-period goals from the Knights busted open Game 2 of their second-round series with Guelph and led London to a 7-0 win. Kevin Hancock led the way offensively with two goals and an assist, scoring the winner for the second game in a row. This time it came just over three minutes into the first period as a puck ricocheted to the overage forward in front of the net and he put it home. Hancock scored the fifth goal of the game as well, but afterward was quick to point to something other than London’s prolific offensive output or shutdown defensive game as a major key to the victory. Kooy made 27 saves in all for his second playoff shutout and his seventh consecutive win in the Knight net dating back to the final night of the regular season. His biggest came during a Guelph man advantage in the second period, when he flashed his glove on a Sean Durzi shot. Kooy happens to wear number 31 and it seemed to pop up all afternoon. 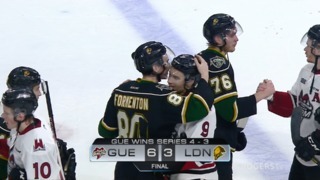 Liam Foudy scored 31 seconds into the third period to put London ahead 3-0. Just 31 seconds later, Josh Nelson made it 4-0 and then 1:31 after that, Hancock’s second of the game had the Knights in front 5-0 and Storm starting goalie Anthony Popovich being replaced by Nico Daws. 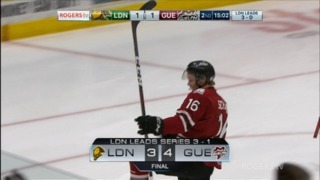 London held Guelph’s power play to 0-for-4 and scored two goals on four chances on their own man advantage. The teams will be back on the ice on Monday at the Sleeman Centre in Guelph for Game 3. The words “put the puck on net and good things can happen” came true to open the scoring in Game 2. 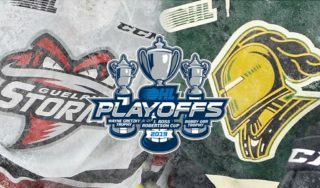 Foudy put the puck on the Guelph goal and had it go off a leg right to Hancock, who buried his second goal of the series and third of the playoffs for a 1-0 London Knight lead through 20 minutes. Matvey Guskov put London ahead as he converted a 3-on-2 by the Knights with a wrist shot off the post and in. Foudy started an avalanche early in the third period as he cut around Guelph defenceman Markus Phillips, got to the net and scored to make it 3-0 for the Knights just 31 seconds after the opening faceoff. 31 seconds after that, Nelson stole a puck and used his speed to outrace anyone in a Storm uniform and score to lift London to a 4-0 lead. Hancock made it 5-0 for the Knights 1:31 later as he took a shot that Popovich stopped, but Popovich could not find the puck. Hancock scooped it up and tucked it inside the post and that ended the day for Popovich. Adam Boqvist scored off the faceoff as London began a power play to put the Knights ahead 6-0. Will Lochead finished the scoring with his first goal of the playoffs as he showed off quick hands as he corralled a shot that missed the net and hit off the end boards and wristed it past Daws and into the Guelph net. With the Knights leading 1-0 and fending off a 4-on-3 Storm power play that had an ice surface full of NHL prospects Nick Suzuki, Isaac Ratcliffe, Nate Schnarr and Durzi, Schnarr swooped into the slot and picked up the rebound of a Ratcliffe shot. He threaded a pass to Durzi in the high slot and Durzi rifled a shot toward the top right corner of the net only to have the glove of Kooy shoot out and grab it. The teams go right back to work on Monday night, but this time in Guelph. The Storm won the only game the teams played in Guelph following the trade deadline.